A chat with mega-rich potential backers is one worth having when you’re a company seeking investment – especially when it’s also a slot on a TV show watched by millions. That was the opportunity for Nottingham-based coffin company eco Rest®, which was invited to take part in an episode of top-rating BBC2 show Dragons’ Den – via an email from a TV researcher. “They told us there are around 200,000 applicants for the programme so we were very lucky,” says co-founder Dale Bywater. “But I think they wanted something ‘quirky’, which is how the media often views the funeral trade. We’d had lots of coverage in local papers, radio and TV when we launched the coffins, and that was picked up by a BBC researcher. 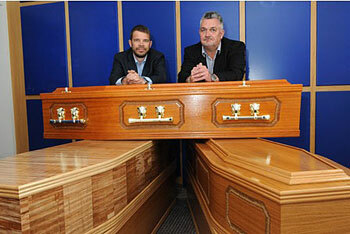 Launched two years’ ago, eco Rest® coffins are made from agricultural by-product called By-Board. Straw-based, it is made from the stubble left after crops are harvested. It doesn't use trees and is bonded together with a non-toxic resin. Dale ended up sending a tentative response to the researcher’s email and got a call the next day. He talked for an hour, answering all sorts of questions and, the day after that, was invited to a video interview at BBC studios in Manchester. He and fellow founder Laurie Smith took along a few coffins and were filmed three or four times throughout the day. A week later, they were invited to come on the programme. “We didn’t have much time to think about it, which was probably a good thing,” says Dale. In the end, the production team settled for hiding the coffins behind a screen until the dragons had come in and sat down. Doing the pitch itself was a bit of an ordeal in many ways. “It was nerve-racking,” says Dale. Unfortunately for Dale and Laurie, none of the dragons were seized by the urge to reach for their chequebook and they left without getting any of the investment they were seeking. There were words of encouragement from Peter Jones, however. “He said afterwards that he thought we’d done great and he wished us all the best; it just wasn’t the business for him,” adds Dale. “And that’s the thing really. The dragons’ expertise is not really in this market and the applicants are so varied – our competitors on the programme included a lady selling stick-on soles for high-heeled shoes and a pair selling out-of-date food via the internet – so we weren’t that surprised. Following tests, the company has ascertained that the coffins are not suitable for cremation, because a compound used in the straw means darker cremated remains than wood and more of them, as it doesn’t break down as effectively. “So we’re now promoting the coffins as a burial option only – particularly for woodland burial,” explains Dale. “We’ve signed a deal with a major funeral company and one with another coffin company and we’ve had some interest from investors as a result of Dragons’ Den but we’re still open to offers.